Sometimes I choose a Fossil of the Week from our Invertebrate Paleontology teaching collection because students have responded to it in some way. 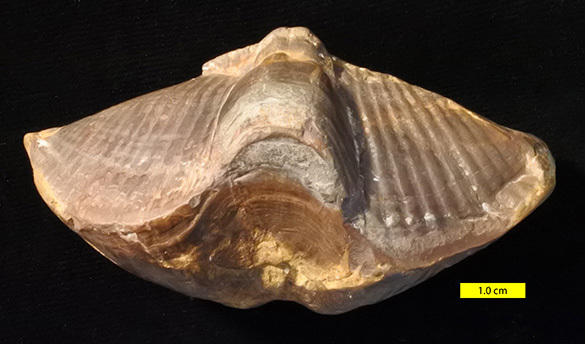 This week’s fossil brachiopod has confused my students a bit because it is an internal mold (unusual for brachiopods in our experience) and a member of the Order Spiriferinida rather than the Order Spiriferida. (Catch that? The difference is in two letters.) It is Syringothyris texta (Hall 1857) from a local exposure of the Logan Formation (Lower Carboniferous). Above is a view of the anterior showing the medial fold and sulcus (like an anticline). 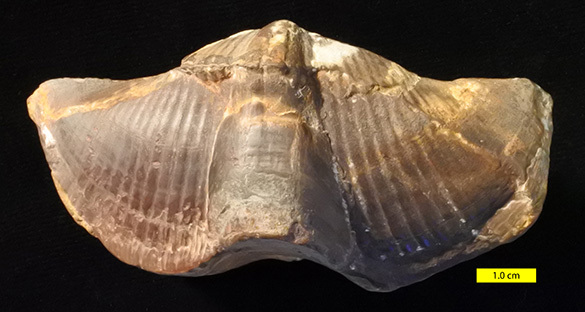 This, by the way, is the largest brachiopod in our collection. Syringothyris Winchell, 1863, is a genus within the order Spiriferinida, as noted before. This order was erected in 1994, pulling it from the more familiar Order Spiriferida. In this preservation, the spiriferinids are distinguished by a high cardinal area in the posterior (shown above). Not much higher than the spiriferids, truth be told. This is a view of the dorsal valve side of this internal mold. Note the absence of ribs (plicae) on the fold in the middle. The geologist and paleontologist Alexander Winchell (1824-1891) named and described the genus Syringothyris. 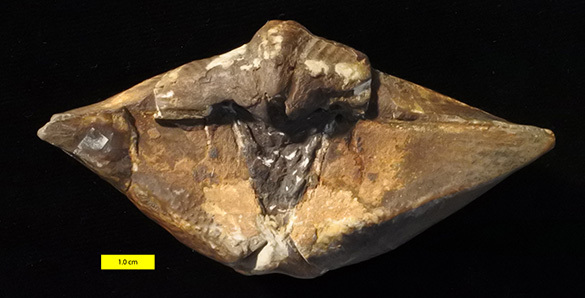 We met Winchell before in this blog as he described many common fossil taxa in the Midwest. He was born in upstate New York, a seventh-generation New Englander. In 1847 he was graduated from Wesleyan University in Connecticut. He had a varied and peripatetic career, spending most of his time as a teacher of science. He first taught in New Jersey, New York and Alabama, staying a short time in each place. He founded the Mesopotamia Female Seminary in Eutaw, Alabama, and became president (briefly) of Masonic University in Selma. 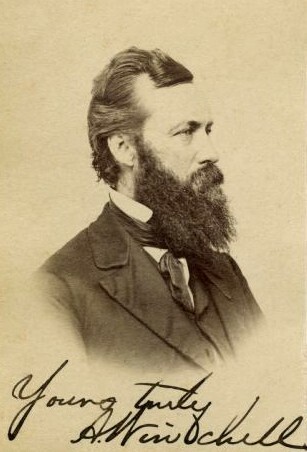 In 1854, Winchell was appointed professor of physics and civil engineering at the University of Michigan, a position that soon became geology and paleontology. Five years later he became the state geologist of Michigan, a job characterized by an apparently difficult relationship with his superiors. In 1872 he left Michigan to be chancellor of Syracuse University, lasting only two years. Next he was a professor of geology and zoology at Vanderbilt University, a position he was forced to resign from in 1878 due to his unbiblical views of evolution. Winchell then returned to the University of Michigan, again as a professor of geology and paleontology. There is where he died. Winchell’s views on evolution were complicated by his religiosity, and his religious life was made difficult by evolution. He developed a kind of transcendental Darwinism in which selection was reduced to inflexible laws from the Creator, a view we would today call Intelligent Design. He then confused it all by writing a popular book called Preadamites, published in 1880. 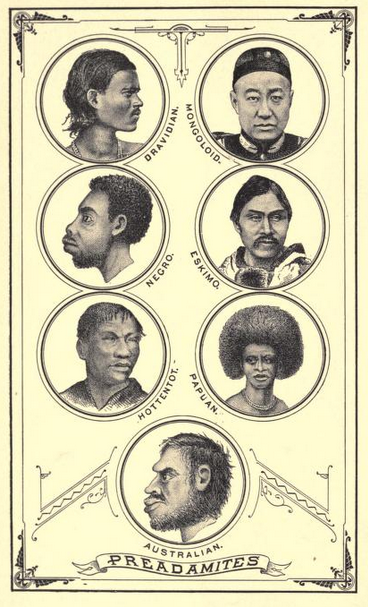 The darker races, he said, lived in Europe and Asia before Adam. 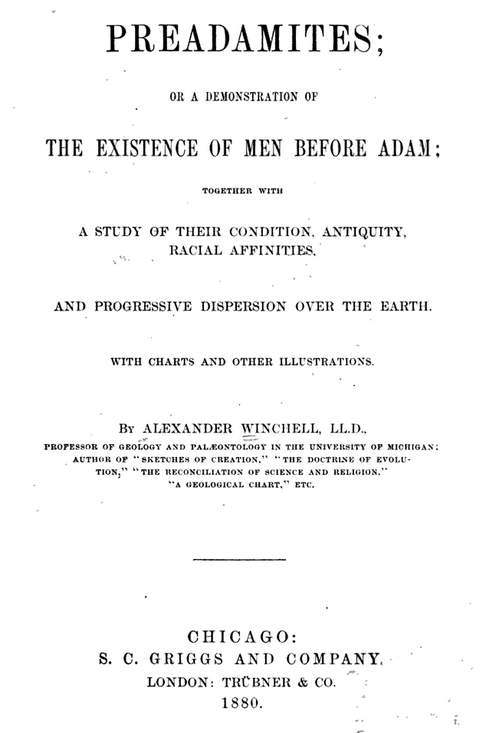 Adam and the subsequent “Noachites” were derived from Negroes, according to Winchell, advancing steadily in intellectual development and whiteness while the black race and other Preadamites were left behind. This work is profoundly racist and pseudoscientific, despite the Darwinian gloss he attempted to paint over it. Bork, K.B. and Malcuit, R.J. 1979. Paleoenvironments of the Cuyahoga and Logan Formations (Mississippian) of central Ohio. Geological Society of America Bulletin 90: 89–113. Vörös, A., Kocsis, Á.T. and Pálfy, J. 2016. Demise of the last two spire-bearing brachiopod orders (Spiriferinida and Athyridida) at the Toarcian (Early Jurassic) extinction event. Palaeogeography, Palaeoclimatology, Palaeoecology 457: 233-241. Winchell, A. 1863. Descriptions of FOSSILS from the Yellow Sandstones lying beneath the “Burlington Limestone,” at Burlington, Iowa. Academy of Natural Sciences of Philadelphia, Proceedings, Ser. 2, vol. 7: 2-25. Winchell, A. 1880. Preadamites; or a demonstration of the existence of men before Adam. Chicago, S.C. Griggs and Company; 500 p.